Soneva Jani | Soneva Jani - resonate in all aspects of the Soneva experience, from the décor of the resort’s villas to our personalized services. 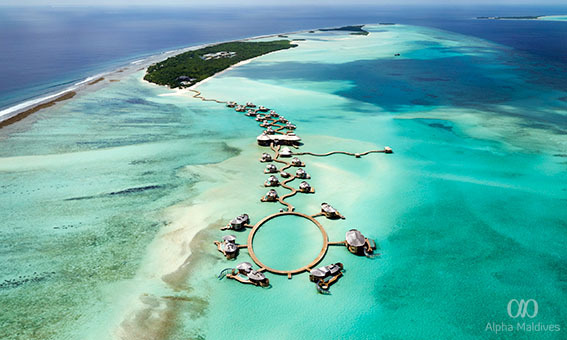 Situated in Noonu atoll amidst the Medhufaru lagoon, Soneva Jani resort is the most recent expansion of the Soneva brand. Named after a word that means “wisdom” in Sanskrit, Medhufaru island is 150 acres in size, and has a 5.6 km secluded lagoon, offering sanctuary in the form of sun, sand and clear blue waters that stretches for miles. What sets the Soneva brand apart from other luxury resorts in the Maldives is their environmentally conscious and sustainable philosophy, SLOW LIFE (Sustainable-Local-Organic-Wellness Learning-Inspiring-Fun-Experiences). Focusing on reducing wastage and recycling, their philosophy resonates in all aspects of the Soneva experience, from the décor of the resort’s villas to their personalized services. This luxury resort can be reached via a 40 minute seaplane ride from Male’ International Airport, or in an hour by speedboat. Private and spacious, all villas feature earthy hues and blue shades, and are made from sustainably sourced, up-cycled materials. Drawing inspiration from the tropical surroundings of the Maldivian islands, the interiors and furnishing work hand in hand to enhance the island experience Soneva Jani offers. Currently housing 25 villas, and additional villas to be completed in 2017, these retreats check all the boxes one would look for in a luxury getaway. These two-storey villas are perfect for soaking up the sun with plenty of outdoor seating and sunken sun loungers. The villas also come with a private pool overlooking the shimmering lagoon, a large master bedroom with a retractable roof for star gazing, and a sleeping area for the little ones, a study, and en suite bathroom complete with a dressing room. The top deck features a dining area perfect for basking in the scenery, and 10 of these water retreats feature water slides, where you can slide down the second floor and plunge into the salty sea below. Mr. or Ms. Friday (Butler) service. Spacious master bedroom, with adjoining kids sleeping area. TV & sound system with extensive movie & music playlists. Open-air bathroom with tub, shower and lagoon access. Bicycles or tricycles for every guest. Private swimming pool, with catamaran nets. Walk-in mini-bar with espresso machine and private wine cellar selection. Personal safe, AC and fans. Outdoor deck and seating area with sun loungers and direct access to the lagoon. Three dining locations: on the sunken. Complete with a pool, catamaran net and ample seating options, the Two Bedroom Water Retreat comes in two floors. The first floor features a spacious master bedroom, with an en suite bathroom, dressing room and an outdoor shower. Perfect for a night in, these villas are equipped with a TV lounge and a walk-in minibar. Over on the second floor, the second room comes with its own dressing room and bathroom, with additional seating. The dining area is also located in the second floor, with one of the villas having a private water slide. This luxurious three-bedroom water villa comes with three different in-house dining locations, a personal fitness centre, en suite bathrooms and a study. With a palette of creams and whites gracing its interiors, the décor is simple and sophisticated. Providing homely comforts, the villa offers plenty of comfy nooks and crannies to laze the day away. Complete with a water slide and uninterrupted views of the lagoon, the villa is expansive, sleek and and caters to all your needs. A finest Over Water Villa, with a huge 1,066 square meters of luxurious living space and uninhabited views in every direction. This huge villa features three private bedrooms, in addition to a study room, a fitness room, an outdoor shower and daybed, TV lounge, walk-in minibar and a sleeping area for the kids, as well as a waterslide from the top deck into the lagoon below. The most grandiose villa Soneva has to offer, the Four Bedroom Island Reserve is packed with modern amenities, plush seating areas to spend the day, and many more depending on your personal preferences. The villa comes with indoor and outdoor living areas, a steam bath, sauna, a personal gym and a TV lounge. Foodies rejoice, as the Reserve houses plenty of dining venues, a wine cellar complete with fine wines to wine and dine at the comfort of your villa, and its very own kitchen to prepare a quick bite to eat. While the master bedroom is situated in the first floor, three more rooms, en suite bathrooms and accompanying dressing rooms occupy the second floor. Cocooned in tropical greenery and facing its very own private beach, this two-storey villa is a spectacle to behold. From private, romantic dinners to large, joyful barbecues, cooking classes, and even Robinson Crusoe-style castaway picnics, Soneva Jani offers ample choices in fine dining that would leave your senses tantalised. Offering tastes from across the world, our chefs only use high quality, organic produce, either hand-picked from our gardens, caught from our waters or shipped to the island from far and near. The hub of the island, The Gathering offers fresh, succulent seafood and classics such as pizzas, tandoors and grilled items. The accompanying Juice Bar is stocked with fresh fruits and refreshing juices to cool down after a fun day in the sun. Ice cream lovers rejoice, as So Cool serves to satisfy your sweet tooth with a delightful selection of over 60 flavours of ice cream, artisan cheeses and gourmet preserves, charcuterie and handmade chocolates prepared delicately by the in-house chocolatiers. Get ready to be amazed at the island’s experimental tasting room as our wine connoisseurs artfully pair fine wines with your dinner, while the chefs continue to awe you with their expertise in culinary chemistry. Watch your chefs prepare your dishes with effortless ease at the open kitchen at So Fresh, while indulging in the selection of organic dining options it offers. Catering to a group of five guests, So Engaging really lives up to its name by offering mystery menus in a private setting. Deck-adence too, aims to captivate you with its overwater setting and relaxing atmosphere. The Observatory’s dining area, So Starstruck combines mouth-watering cuisine with stargazing for a truly magical dining experience. With just four dining tables, So Starstruck is private, romantic and mesmerising. A truly Maldivian experience fused together with fine dining, the Chef only uses fresh produce at The Beach, limited to only what he can catch or pick. Enjoy private, flavourful lunches on the beach while overlooking the waves gently lapping at the pristine shore. Offering comfortable seating and over water catamaran nets, The Gathering Bar is perfect for lounging around while sipping on cocktails, beverages, coolers and tapas while immersing yourself in warm sunny afternoons and balmy evenings the island offers. Located within The Gathering, the Indian Ocean offers a soothing backdrop for Soneva Spa. A combination of ancient healing practices and holistic treatments are featured here, all accompanying natural products at the hands of skillful therapists. The spa also comes with a fully equipped gym and yoga pavilion, and sauna and steam rooms for an all-round fitness experience. Whether you are an adrenaline junkie or looking for a soul-soothing, serene escapade, Soneva has endless experiences to choose from. In addition to relaxing spa treatments, the island’s cinema and observatory, Soneva Jani offers various outdoor sports, romantic cruises, bicycling and walks along the resort’s many nature trails and a variety of water sports to keep you captivated. Multi-lingual, attentive and experienced, the Dive Centre’s expert PADI instructors work to provide an unforgettable experience for divers at all levels. Medhufushi island is home to many dive sites and thriving marine life, providing divers with much to explore. Featuring the first ‘silent cinema’ in the Maldives, Cinema Paradiso redefines the cinema experience with its over-water setting under starry skies. The cinema also offers plenty to munch on, with an assortment of snacks including popcorn, ice cream and beverages, to even scrumptious à la carte dining options. A state of the art telescope provides endless views of starlit skies here, and sums up to an enchanting experience. Complete with four dining tables, they also come with screens to showcasting the view from the telescope. The island of Medhufaru had previously been dedicated for gardening, housing fruit trees and varieties of greens and vegetables, some of which still help stock up the Soneva Jani’s kitchens. Meander through the Labyrinth, a spiritual walkway of ficus hedges forming the ancient symbol to help enhance your path towards positivity. A safe and exciting kids club, the Den lets children explore the island and take part in learning sustainably through a range of fun activities such as gardening, snorkeling, various indoor activities, and even helping to protect our marine life. Perfect for taking home a token from your island escapade, the boutique features an array of jewellery, clothing, books, artisan handicrafts and home wares. Perched up the top deck of The Gathering, the island library showcases a collection of books on the Maldives and its flourishing marine life.